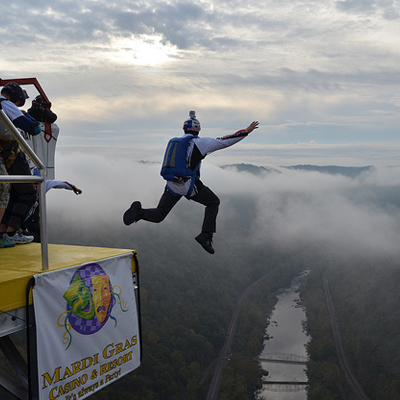 Go Jump Off the Bridge at the New River Gorge’s Bridge Day! Thrill-seekers are counting down the days to Bridge Day 2018, one of the most significant extreme sports events in the world. On October 20th, just outside of Fayetteville, WV, the New River Gorge Bridge closes to traffic for six hours. Crowds of up to 80,000 gather to watch BASE jumpers fly off one of the highest arch bridges in the world and into the New River below. Pedestrians are welcome to walk across the bridge and absorb the stunning views from a height of almost 900 feet. Bridge Day is a treasured West Virginia tradition, celebrating one of its most famous landmarks. Opened in 1977, the New River Gorge Bridge was an enormous engineering achievement and a boon to the area’s economy. The bridge is such an iconic symbol of West Virginia that it appeared on the state’s quarter in 2005. Given its significance, it didn’t take long to attract early enthusiasts of the extreme sport known as BASE jumping. BASE jumping, simply put, is parachuting from a fixed point. It is significantly more dangerous than skydiving and is considered a hazardous activity even with skill and experience. The first person to BASE jump from the New River Gorge Bridge was Burton Ervin, a decorated Korean War veteran who jumped illegally in 1979, just a couple years after the bridge opened. Since then, BASE jumping has become a favorite outdoor extreme sport, and Bridge Day is easily its most significant annual event in the US. In 2017, 348 jumpers from 33 states parachuted off the bridge. Participants can choose to jump from a platform, a diving board, or most intriguingly, the “human catapult,” a hydraulic launch pad. Although BASE jumping is inherently risky, the New River Gorge Bridge is considered an exceptionally safe site. There have only been three fatalities in the event’s history, and none since 2006. For those who would prefer to keep their feet on the ground but still get a taste of adventure, there is plenty to do. For a unique Bridge Day experience, join a whitewater rafting trip with Adventures on the Gorge to watch the jumpers from below. Check out the Bridge Walk, a guided tour of the catwalk that runs directly underneath the bridge. Register for the Bridge Day 5K to race across the bridge and into nearby Fayetteville. After the festivities end, head into Fayetteville for refreshments at Pies & Pints or The Secret Sandwich Society. Also, don’t miss the Bridge Jam, a family-friendly festival with live music and craft beer that runs the whole weekend. Bridge Day is held one day only, so don’t miss out! Be there October 20th, from 9 am – 3 pm! Whether you want to take a leap off the bridge or soak in the fall colors, Bridge Day is a quintessentially West Virginian experience. The Fayetteville area lights up this time of year, so don’t miss it. For more information on shuttles, events, and vendors, check out the official Bridge Day website.